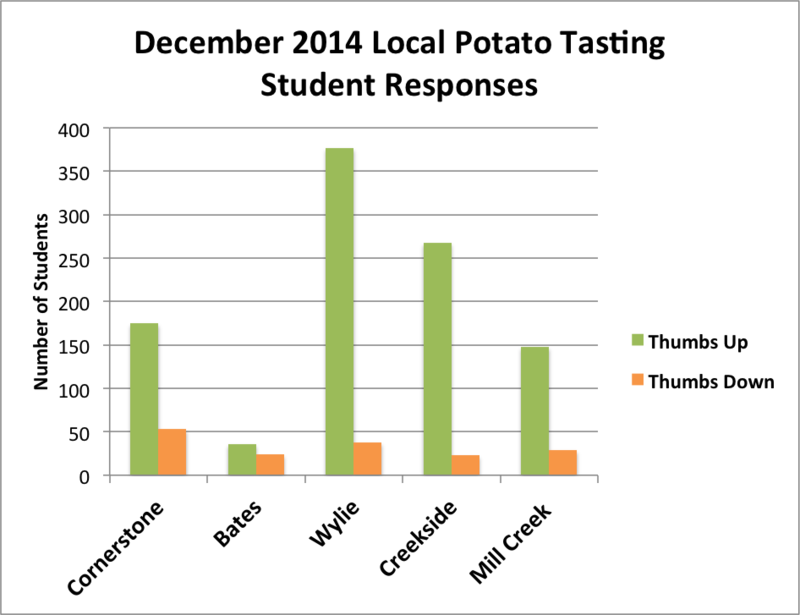 Last year, Dexter students in grades K-6 were able to try roasted potatoes from two farms within 15 miles of their schools. The potatoes were featured in cafeteria taste tests, not on the lunch line, and in only the elementary schools. But they were a hit! school food service was able to purchase a greater volume from local farmers. With those successes, we still had some challenges. This month, the potatoes came from 4 different farms that are within 200 miles of the schools, which is further away than we’d like. However, we are still working on ways to get local supply chains to meet Dexter Food and Nutrition’s needs while still getting in food grown on farms within our immediate vicinity. Check out this map of our local producers to see the trends in our local purchasing so far. Students voted during taste tests in the cafeterias this month. Students at Creekside Intermediate school were going to great lengths to try to get “seconds” on samples. Parent volunteers reported a group of boys switching sweatshirts to try to get extra freebies. Food and Nutrition staff were able to tell the students this month, though, that if they wanted to eat more local potatoes, they could get them the next day in school lunch line! Even students who normally bring lunch from home were excited to learn that they could bring $0.50 and get just a side of the local potatoes. Also, the potatoes were quite pretty and so were our volunteers! . . .
All Red Potatoes and Tri-Colored Fingerlings being cut up at Cornerstone Elementary. University of Michigan School of Public Health interns helped us out this month! Elizabeth was a rock-star volunteer this month!